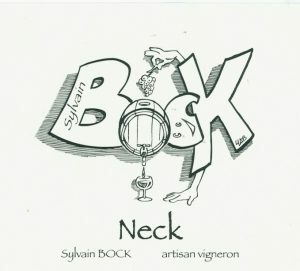 Sylvain Bock produces exciting white and red wines in the mountainous Ardeche region of southern France. He grew up in the Northern Rhone and worked for Ardeche legend Gérald Oustric from Domaine du Mazel from who he now leases one of his vineyards. Sylvain produced his first vintage in 2010. The vineyards see both basalt and limestone present. The limestone from ancient seas and the basalt from the volcanic activity that was prevalent in past eras here. Many of the vineyards are strewn with limestone rocks as you can see in the photo below, but as you move north through the valley the basalt becomes more prevalent. 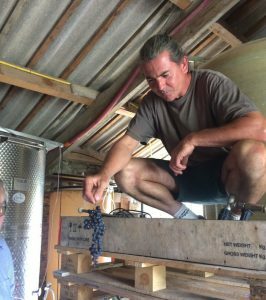 Sylvain works without using sulphur and he matures his wines in fibreglass and stainless steel tanks and old oak barrels depending on the particular wine he is making. He also likes using carbonic maceration to ensure the vibrancy of the wine. The grapes are placed in the tanks and carbon dioxide pumped in to ensure an anaerobic environment. The grapes then slowly generate alcohol inside the grapes through the action of enzymes within the fruit rather than the action of the yeasts on the grapes. The photo below shows some grapes that Sylvain retrieved from a tank where the maceration had been going on for some time. As you can see they are still in pretty good shape! His vineyards are in a particularly scenic part of the Ardeche near the pretty town of Valvignères. 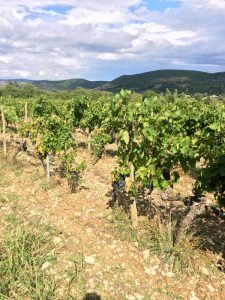 There are two main sites – the old Mazel site between Alba la Romaine and Valvignères (which is where the photo of the limestone above was taken) and a site further up in the volcanic area near the town of Sceautres where he grows Grenache and Gamay. He bought this site in 2013. 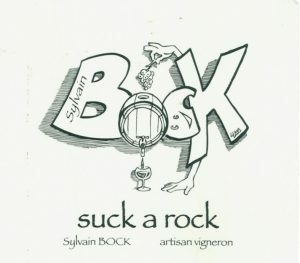 Sylvain does not add sulphites to any of his wines. The La P’Tite Goutte is an exciting red wine from Sylvain Bock that is light, delicious and smashable. It is made from Grenache which has been fermented using carbonic maceration where the juice has been taken off the must three times to ensure it did not become too tannic. The result is a delicious, eminently drinkable light red wine that provides a window into the more serious Neck cuvée also made from Grenache. Sylvain is an amazing winemaker with an intuitive feel for what will work with the bounty the vines have delivered to him! This is the first time we have been able to import this wine. We have enjoyed it on occasions in Paris wine bars such as Vivant Cave when the redoubtable Pierre Jancou ran this gem of a place. Pierre does not like wines that have had sulphites added and he always had the wines of Sylvain on his list for two reasons – the first is the lack of added sulphites and the second because they are delicious! This year it comprises 100% Merlot which underwent carbonic maceration and then spent 10 months in wooden barrels that were between 6 to 8 years old. The name is very appropriate because we often talk about natural wines and minerality. 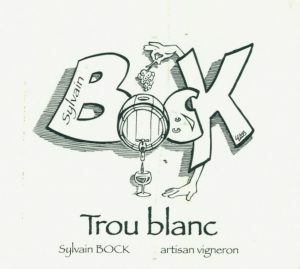 Trou Blanc is the name given by Sylvain to this white wine which has completely fermented to zero residual sugar. It is made from prime Chardonnay and Grenache Blanc organic grapes grown in the Ardeche region in a vineyard that is strewn with limestone rocks as is shown in the photograph at the start of this page. And it is a beauty! Crisp, long, refreshing and delicious. This wine is priced very well and is perfect for pairing with food or for just smashing. This wine is made from Sylvain’s best Chardonnay grapes from the 2013 vintage that have been crushed then matured in old oak barrels for 12 months to gain greater complexity. This is one of his leading cuvées and one that has great depth and great elegance. There is also a nice streak of minerality that comes from the limestone rocks that litter the vineyard. As with all his wines, no sulphites have been added at any time in the winemaking process. This wine is made from Chardonnay that has been matured in old oak barrels for twenty four months – hence the name. The time spent in old barrels has produced an elegant, soft, subtle wine of considerable charm. Don’t expect a big, buttery, oaky wine – this is a polar opposite! Only 600 bottles of this wine were produced from the 2013 vintage (and about the same for the 2014 vintage) so we were lucky to receive this small allocation. This wine also displays intriguing floral aromas as well as anise notes. The old barrel maturation also ensures that the wine is clear and bright in the glass. This is an elegant, refined and compelling wine that truly benefits from the long elevage. 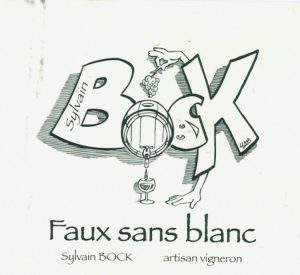 Faux Sans Blanc is a refreshing white wine made from two thirds Chardonnay and one third Grenache Blanc. Sylvain fermented and matured this wine in a fibreglass tank to ensure it remained fresh and lively. The finish on this wine is stunning with a slight level of residual sugar providing a balance to the natural acidity in the wine. It is bottled in clear glass with a crown seal because it was bottled with 6 grams of residual sugar which will ferment to produce a faint sparkle in the wine making it a perfect aperitif wine. Thee name for this wine is, once again, a play on words that French winemakers seem to particularly love. 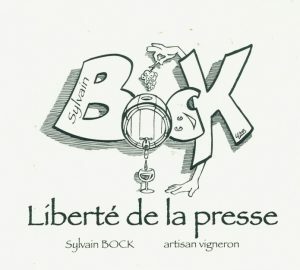 While the name might conjur up thoughts about the freedom of the press in this case the name arose from the wine that was “liberated” at the end of the pressing of both the Chardonnay for the Le Fruit de la Patience and the Grenache Blanc used in the Faux Sans Blanc. Sylvain has produced a beautiful wine with these two grape varieties that is drinking beautifully right now. This red wine from the Ardeche exhibits strength, freshness and refinement. Despite the underlying strength of this wine it is ready to drink and to give much pleasure in doing so! This 100% Syrah has been matured in barrels that are between 2 and 4 years old so that no wood flavours dominate this wine. 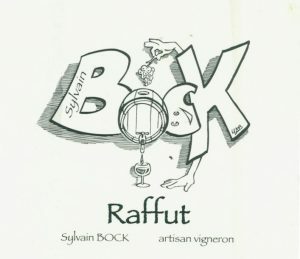 Sylvain is particularly happy with this vintage of Raffut, describing it as “silky and smelling of violets”! Sylvain has put two thirds of the grapes through carbonic maceration to provide the freshness and drinkability that it shows and the remaining third has been fermented traditionally to provide the underlying structure for the wine. If you like the wines of the northern Rhone then you will love this one! 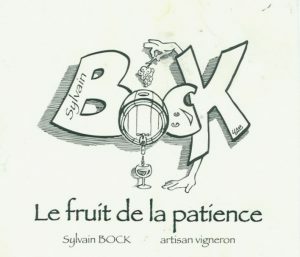 This young, red wine from Sylvain Bock is a blend of two different parcels of Grenache Noir. Both parcels are on a mix of limestone and basalt soils with one parcel having 50 year old vines that are pruned using the gobelet method and the other 30 year old vines. The grapes were put through carbonic maceration to produce a fresh, vibrant and exciting wine that will have good aging potential. It was named after the old volcano in the Ardeche where the vineyard clings to the lower slopes. 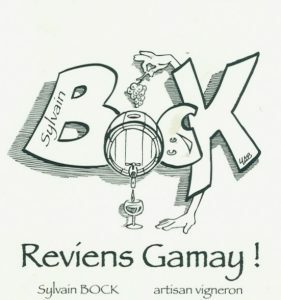 Reviens Gamay has been a runaway hit in both of the years we have brought this wine to Australia. It usually sells out within a few weeks of arriving, and we expect this silky Gamay from 2016 to be similarly sought-after. This is a wine made from two different vineyards of Gamay. One is planted on pure limestone and the other on pure basaltic (volcanic) soil. This year he also used 10% of his Grenache in this wine to give it a little more body. The whole bunches were co-fermented using the carbonic maceration approach. This is a very fruity, smashable wine that is drinking very nicely now but will continue to improve for the next two or three years. This is the first time we have been able to buy this very tasty wine! It is named after the three grape varieties used for the wine. GRE is for Grenache Noir, LOT references the Merlot and the S stands for Syrah. This combination produces a wine that has complexity and structure while maintaining freshness and drinkability. This is a very interesting wine!